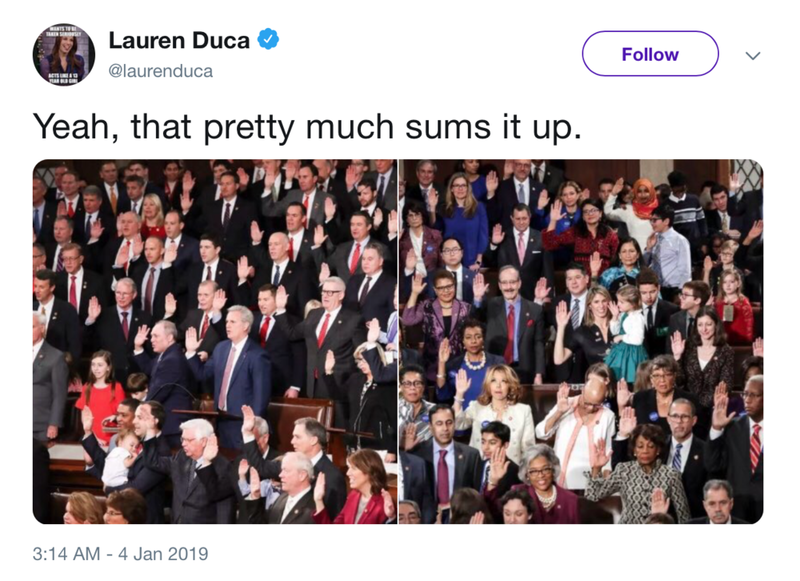 A photo posted on Twitter by journalist, Lauren Duca, depicted the reality of the 116th Congress swearing-in ceremony on January 3rd, held in Washington D.C. The tweet speaks for itself, portraying a literal and photographic fission of the Republican and Democratic parties. Not only does the addition of the 127 women that were sworn into Congress shatter the glass ceiling, but their distinct fashion and beauty choices also relinquish a new wave of empowerment and diversity. The newly appointed congresswomen raised much excitement for the Democratic party as the balance of power is expected to be shifted in Washington. In days past, videos have been seen and criticized of the congresswomen dancing, rallying, and posting their outfit choices for the ceremony on social media. Fashion is an outlet of expression for many, and although the GOP may not see its significance in politics, representation speaks volumes. Rashida Tlaib is the first Palestinian-American woman to serve in Congress and thus decided to communicate this feat by wearing a traditional Palestinian thobe from her mother's closet. The representative from Michigan attended the ceremony in the beautiful thobe which was embroidered with subtle yet stunning flowers. Unlike the sea of black and navy blue suits in the rows of Republicans, congresswoman, Illahn Omar from Minnesota, made a historic statement as the first woman to wear a flourescent orange hijab at the ceremony. She was the first person to be allowed to wear a religious head-covering on the floor in 181 years. Both the thobe and the hijab served to represent each congresswoman’s heritage and brings forward a new era for many young Middle Eastern and Muslim girls and women in America to look up to. On Twitter, a frenzy began with the hashtag, #TweetYourThobe where other Palestinian-American women flooded the site with proud photos in their own thobes, accompanied by words of endearment for the congresswoman. The 2018 midterm elections surely made a major statement, and nonetheless, the fashion and beauty choices for the ceremony were descriptive of this empowered demeanor as well. According to Alexandria Ocasio-Cortez, Sonia Sotomayor was once advised to remove her bright red nail polish and stick to more neutral tones for a political setting. She ignored the advice, and this inspired Ocasio-Cortez to sport gold hoops and a bold red lip for the ceremony in 2019. This is reflective of the public scrutiny that women receive regarding their attire on a daily basis. "Next time someone tells Bronx girls to take off their hoops, they can just say they're dressing like a Congresswoman," said Ocasio-Cortez on Twitter. A common theme was the statement made by the several congresswomen who chose to wear all white. The color white has been known to represent the women who charged an incredible revolution with the Women's Suffrage movement and creates hope for the new wave of voices that are ready to propose significant changes in the present-day. The most beautiful takeaway from all of this, however, is what this inclusivity means for the future of politics. Representation matters, minorities’ voices matter. Being allowed to wear a hijab on the Congress floor may communicate that there is still a long way to go, but it is an incredible feat. Our government should be a reflection of community, culture, and reach out to everyone, even those who are marginalized. Therefore, fashion plays a large role in this movement.